Scotties (Scottish Terriers) make loyal family pets. They do not need a large garden but do enjoy being taken for walks. They can be a little rebellious when called. They first like to play a bit before they will come to you, but will adapt with training. They can be shy of strangers. Most Scotty breeders are in Gauteng, but there are some in other provinces. Delivery of puppies can be arranged. I’ve sold 4 of the 5 puppies through Petsplace. Thanks so much! Hi Eileen, I have had excellent response to the small advert on Petsplace for my Scotty pups. I had thirteen puppies and the advert sold ten of them. Thank you ! Scottish Terriers are small dogs but are unafraid of starting a fight with dogs three times their size. Scottish Terriers (Scotties for short) originate in the northern part of Great Britain. Scotland was an independent country originally with it's own King and Queen until a royal marriage united Scotland with England. Much of the Scottish countryside - though beautiful - is mountainous and wild. The hardy Scottish dogs were capable of digging rabbits, rats and foxes out of burrows amongst the rocks and under thorn bushes where bigger dogs would be unable to go. The word terrier comes from the Latin "terra" or earth. They like to dig in the earth! Sometimes they would go so deep into burrows that the hunter had to pull them out by their tail. Their shaggy coats kept them warm in the snowy winters. Nowadays it's fashionable to hand strip, or clip the Scottish Terrier's coat short on the back leaving a beard and shaggy eyebrows. The eyebrows help to keep the soil out of the eyes when digging. Some Scottie owners like to leave a "kilt" (skirt) of long untrimmed hair hanging down at the sides of their body, but this can be impractical as it catches on thorns and gets dirty. Many people prefer to cut the hair short. The original colour was wheaten, but the most common colour now is black. Scottish terriers have short legs, but often display great speed by running round in circles or figures of eight! How breeds developed: the early history of dogs. Height at shoulder 25 to 28 cms. Colour: Black, wheaten (a reddish gold), or brindle. NOT white! If you are looking for a white Scottish terrier, it's probably a west highland white terrier a similar, but different breed. 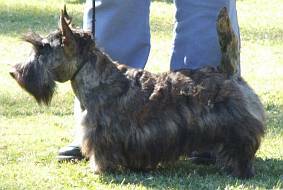 Gelitaru Shooting Star of Woefkardoes, aka Mac Duff, a brindle Scottie, belonging to M. Booysen, South Africa. "Fight the good fight of faith! Lay hold of eternal life!" 1 Timothy chapter 6, 12. 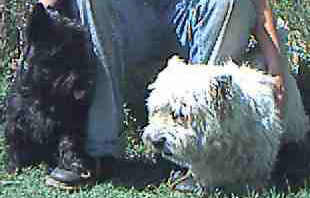 Left: the black dog is a Scotty; the white dog is an elderly West highland white terrier. The Scotties look more "Scottish" if they wear a tartan collar. Tartan - a woven check material- is still worn occasionally as the national dress in Scotland.